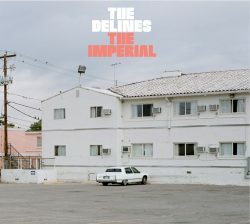 ‘The Imperial’ is an album which has been highly anticipated amongst fans of the The Delines, made up of songwriter and novelist Willy Vlautin (formerly of Americana legends Richmond Fontaine) and vocalist Amy Boone with their band, Jenny Conlee, Sean Oldham and Tucker Jackson, since the release of their 2014 debut ‘Colfax’ which received universal acclaim amongst critics and the public alike and has been a long time coming after an accident which broke both of Boone’s legs and led to two years of surgery before finally being able to finish ‘The Imperial’ – a wait which has been more than worth it. Recorded in Portland, over a long period of time following successful tours and periods of writing/rehearsing, the record takes the elements of the members previous works and pulls them together effortlessly to create an accomplished, confident and original sophomore record, destined to see the same acclaim as their debut, and then some, as it expands on the formula that made the first album so widely revered. Opener ‘Cheer Up Charley’ is a soulful ballad brought to life by the use of textured instrumentation from acoustic guitar and strings to the occasional use of horns to give it a real motown soul feel accentuated by the soulful voice of Boone who brings both the song to life as well as the characters in the song. One of the biggest strengths of the group are these characters, written by Vlautin, now a published author, whose talent to tell a story both in books and through song is undeniable and it comes as no surprise that he has made a name for himself in both is these realms. The vivid imagery of the lyrics is present throughout the record as a whole from ‘Where Are You, Sonny?’ and the detail within the scene which almost takes you there to ‘Eddie & Polly’ a story about a couple who become so real within the song that it’s almost like you know them yourself, it’s difficult not to become engrossed in these stories as the record unfolds. The stamp of Vlautin is also present in the vocal delivery as the phrasing of the lyrics is very similar to that of his work with Richmond Fontaine and whilst Amy Boone is singing the songs, it is clear that his influence has carried over throughout whilst expanding with melody in the chorus parts making it different enough to appeal to wider audiences whilst also pleasing fans that have been looking to hear more of the same since Richmond Fontaines break in 2016. Boone herself, however, isn’t guilty of trying to impersonate anyone and has put just as much of her mark as Vlautin as its clear she hasn’t called anything in as her soulful delivery highlights her investment in these songs and stories just as much as the rest of the group as she soulfully expresses the emotion told in the lyrics with her voice which is both sombre and uplifting throughout and leads the record to the accomplished body of work it is, from start to finish. Overall, this record is everything that fans of the group could have hoped it would be and capitalises on each of the members talents and experience with other groups to produce such a coherent, thoughtfully crafted record in which every note and every piece of musicianship is written to accompany and compliment the lyrical tone of the songs to bring the characters and stories to life. A true masterclass in songwriting from both a lyrical and musical standpoint which is going to be a tough one to beat in 2019!